The apartment is situated in the very center of the town near the main railway station in a quiet neighborhood only 10 minutes walking to the main square of Zagreb. It is 65m2 one bedroom apartment, east-west orientated and located on the second floor of the apartment building. It is newly redecorated in a modern style ideal for families and business people. 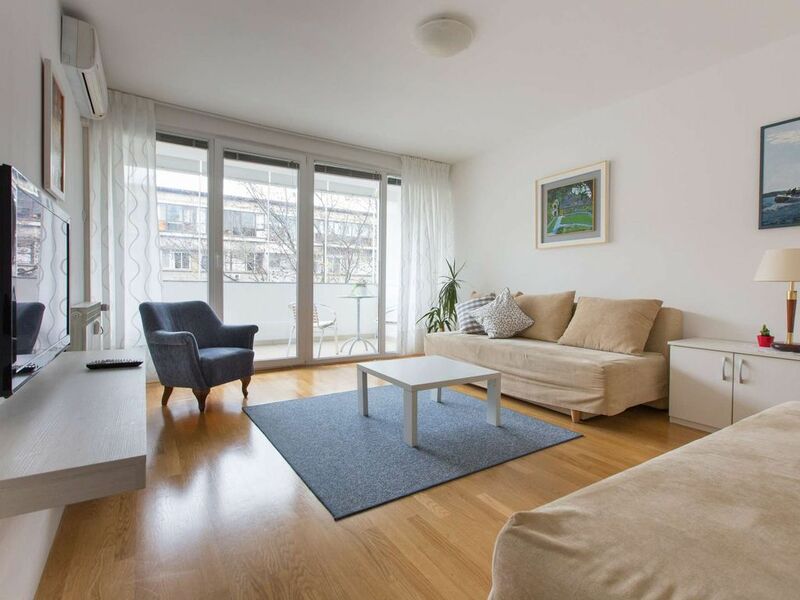 The apartment can accommodate 4-5 persons in the completely furnished apartment which is divided in living room, bedroom, kitchen with dining table, bathroom, terrace, and entrance hall all which makes more than enough space for your cozy and comfortable stay in Zagreb. there is one queen size bed in the bedroom and two double sofa beds in the living room. Central position in town. Easy to reach all the interesting spots in Zagreb just by walking. The apartment is located in one of the old communist block houses and definitely has its charm. The apartment has been renovated and provides plenty of space in addition to easy access to the city centre. Spacious, well equipped and great location! Owner very responsive if you need anything. Had a great time! Lovely apartment quite close to historic area of Zagreb. Quiet area of the city and close to city market and restaurants. Svet our host is wonderful and full of information and tips. She provided names of some restaurants to eat in.... follow her advice as the restaurant she recommended was the best meal we had in our week long visit in Croatia. Our stay at this apartment was perfect. It is very large, very comfortable for 4 persons. It was very clean and very well equipped. Most of all we liked the location. It is just next to the railway station with a big shopping centre in front of the apartment Building. It is very convenient especially if you are travelling by train. The City centre is just 2 min away, and the main square is around 10 min walking. If we come to Zagreb one more time we will surely stay here again. The best thing about this apartment is its location. It is located in the city centre. It is spacious and very bright. The kitchen is great if you love to cook. Large and fully equipped with all appliances. One of the better apartments that we had during our trip. Apartment is situated in very center of the town very near the main railway station in a quiet neighborhood only 10 minutes walking to the main square of Zagreb. Its central position in town will guarantee you very good connection with all parts of the city by public transport and offer you opportunity to reach all of Zagreb's points of interest within walking distance. Bus and tram stops are less than 3 min away from the apartment. You will find lots of cafe bars, shops, restaurant and everything you might need in the vicinity of apartment. There is a grocery shop opened 24/7.